Wed., Aug. 6, 2014, 5:15 p.m.
A woman who crashed into two street signs and an electric pole, forcing the closure of Monroe Street Saturday afternoon, is facing a charge of driving with a suspended license. Rebecca L. Turner was southbound on Monroe about 3:45 p.m. when witnesses said she began travelling fast and swerved onto the sidewalk, according to Spokane police spokeswoman Monique Cotton. 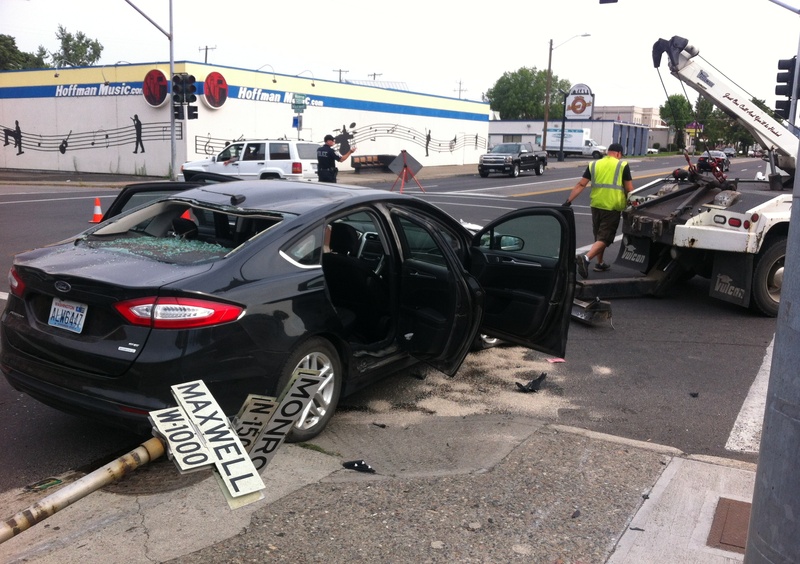 The Ford Fusion Turner was driving came to a rest at Monroe and Maxwell. Two other cars were damaged in the crash. Turner was able to get out of the car and walked around afterward, but witnesses said she was incoherent. She was transported to Deaconess Hospital. Two children in the backseat were uninjured. Police also cited Turner for negligent driving, Cotton said. Published: Aug. 6, 2014, 5:15 p.m.